Steven Rosen of Rock Godz Hall of Fame in an exclusive interview with the legendary axeman Steve Lukather. 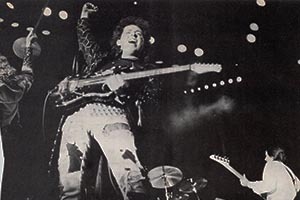 In musician circles, the song is known for its highly influential namesake half-time shuffle, as well as the ending guitar solo played by guitarist Steve Lukather. The drum pattern is known as a "half-time shuffle", and shows "definite jazz influence". Featuring ghost notes and derived from the combination of what Jeff Porcaro called the "Bernard Purdie half-time shuffle" (Purdie shuffle) as well as the variation thereof John Bonham played on "Fool in the Rain" with the well-known Bo Diddley beat. Andreas Varady recording 'Human Nature' for his self-titled debut album 'Andreas Varady' feat. Steve Lukather, Greg Phillinganes, Harvey Mason, Brian Bromberg, Paulinho Da Costa, Steve Porcaro and David Paich.